Memorial Day: Latino Heroes & Borinqueneers. Ceremonies at Valley Forge’s Medal of Honor Grove mirrored those at the Vietnam and Korean War Memorials, but had a heightened sense of elation, arriving just six days after the passage of legislation honoring the Puerto Rican soldiers of the 65th Infantry Regiment, better known as the “Borinqueneers,” with the long sought Congressional Gold Medal. Besides fighting Chinese and N. Korean enemy soldiers, along with elements that included weather that Consul Baum noted often dropped to “40 degrees below zero,” the Borinqueneers also faced the hurdles of discrimination. According to Korean War Veteran Hector Maisonave, they were still segregated – despite changes initiated by President Truman- and were often referred to as “dogs and spics,” and typically given “old” and inadequate clothing and equipment. The Congressional Gold Medal is the highest honor bestowed by Congress on any individual or group. The endeavor was spearheaded in Philadelphia by Veteran, U.S.M.C. Juvencio Gonzalez, an aide to Sen. Stack, and Veteran U.S.M.C. George Perez, an aide to U.S. Rep. Bob Brady. “These advocates are the heart and soul of this movement and I am in awe of what they have accomplished,” said Puerto Rico’s Resident Commissioner Pedro Pierluisi, referring to Juvencio Gonzalez, George Perez and others. After an introduction by Latin-American Post 840 Commander Jose M. Melendez and Unit 840 President Candida Gonzalez, remarks were offered by Jason Raia, V.P, Freedom Foundation; Dr. Emilio Marrero, (Ret.) Cpt. US Navy; Deborah Meserve, Col. 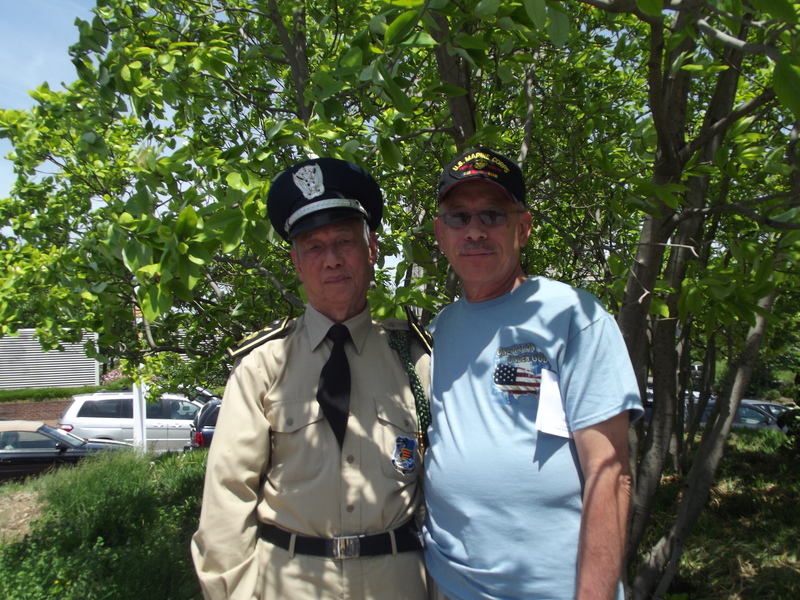 US Air Force and Tim Meserve, (Ret.) Lt. Col. US Air Force. Wreaths and flowers were placed at the Medal of Honor Obelisk which honors the Puerto Rican Medal Of Honor recipients by: Latin-American Auxiliary Unit 840; Latin-American Post 840; Hispanic-American Riders Assoc. ;National Assoc. of Puerto Rican Women; Milian Rodriguez Funeral Home; and Olga and Jose Melendez. The five original Puerto Rican recipients of the Medal of Honor, that included PFC Fernando Luis Garcia, CPT Humbert Roque Versace, PFC Carlos James Lozada, SPC4 Hector Santiago Colon and Cpt. Euripides Rubio, now have four additional names. Following a lengthy investigation that determined a number of Jewish and Latino soldiers deserved the recognition for their service, the list also includes: Private Demensio Rivera (Korea), Private Miguel A. Vera (Korea); MSG Juan E. Negron (Korea) and SSG Felix M. Conde-Falcon (Vietnam). During the hour-long ceremonies at the Korean War Memorial, a crowd of more than three hundred heard from several dignitaries, but perhaps the most inspiring and briefest remarks came from Northeast Philadelphia’s Kevin McCloskey. A Veteran of Iraq and Afghanistan, McCloskey lost both legs when an IED struck his vehicle in 2008. CBS3’s longtime Weatherman Tom Lamaine spoke of following the example of his Father and two uncles -who served in the Air Force during WWII- by joining the Air Force during the early years of the Vietnam war. The concluding wreath laying at the Vietnam War Memorial ceremonies featured a wreath offered by South Vietnamese soldiers who fought as the allies of the American forces in a war that took more than 58,000 lives. Among the 646 Philadelphians on the city’s Vietnam war memorial are those of: David Flores, Julio Morales, Louis T. Ortiz, Angel Reyes, Samuel Rodriguez, Angelo C. Santiago, Antonio A. Solis and Roberto Torres. After the former South Vietnamese soldiers had laid their wreath, the commander of the group, Ean Nguyen, came over and shook hands with Jose Rivera, a Vietnam Veteran and former Commander of the Latin-American Legion Post 840.
:Philadelphia – At 7:30 am, Tuesday, the voting precinct at 4th and York had been open for just a half hour, yet the streets surrounding the John Welsh public school were already teeming with up to two dozen 19th Ward committeemen, women and campaign workers. Despite more than $30 million spent by gubernatorial candidates McCord, McGinty, Schwartz and Wolf – $10 million alone- their was scarcely any election day visibility in traditional form of posters or fliers. Nevertheless, an upbeat advertising campaign that highlighted Mr. Wolf’s peace corps experience and later business success -which he shared with his workers- helped propel his overwhelming victory in the Democratic Gubernatorial primary, Tuesday, earning him to make history by unseating incumbent Republican Tom Corbett. Winning more than 480,000 votes or 58 percent of the total vote, Wolf outpaced his three Philadelphia-based Democratic opponents, as Allyson Schwartz took (18%) of the vote, Rob McCord (17%) and Katie McGinty (8%). From a York city baseball park, Mr. Wolf offered a victory message that referred to the “clear choice” voters will have in 2014. “We have a clear record of an administration that wants to hollow out our schools, wants to play fast and loose with jobs, that wants to take our natural assets and play fast and loose with them,” added Mr. Wolf. Having served nearly two decades, Sen. Tartaglione faced a primary challenge from Harvard grad Tomas Sanchez, a former Chief Legislative aide to two City Councilmen, and former Councilman Dan Savage. During his campaign, Sanchez stressed his commitment to improving education. Despite newspaper endorsement to Mr. Sanchez, Ms. Tartaglione was reelected to the 2nd district Senate seat, winning 51% of the vote, while Dan Savage took 29% and Sanchez, 20 percent. In the race to replace J.P. Miranda in the 197th district, Leslie Acosta, a teacher, won 2,852 votes, defeating former State Rep. Ben Ramos (1,243) and Businessman Danilo Burgos (1,334). Of supporting Leslie Acosta for the 197th seat, rather Ben Ramos or Danilo Burgos, Mr. Gonzalez replied, “We just need a change, we definitely need a change.” Ms. Dones nodded in agreement. On the Monday before the election, U.S. Congressman Bob Brady and State Sen. Vincent Hughes united with State Rep. Maria Donatucci, Councilman Curtis Jones, Councilman Kenyatta Johnson and union leaders of SEIU 32BJ, to urge Philadelphia International Airport workers to vote “Yes” on a minimum wage ballot question. One of three ballot initiatives, it would give the City Council authority, under the city charter, to establish a minimum wage and benefits for workers employed by subcontractors that receive city funds. When an airport official asked U.S. Rep. Brady (d) not to talk to workers, this only spurred the leader of the city’s Democratic party to insist on talking to the workers. “I’m going to go down there and make sure I talk to them,” asserted U.S. Rep. Brady, waving a “Vote Yes” poster for minimum wage initiative. 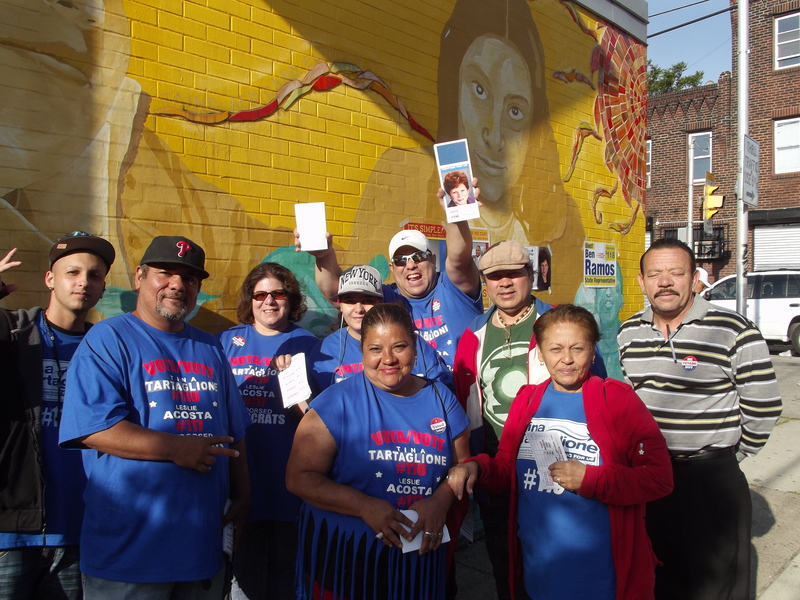 And on the Sunday before the election, Councilwoman Quinones and candidate for Governor McCord made a final appearance with hospital workers at St. Christopher’s Hospital on Erie Ave.
A vocal defender of labor rights, raising the minimum wage, improving schools, expanding Medicaid and providing services for Pennsylvania’s Veterans, Northeast Philadelphia’s State Sen. Mike Stack won the race for Lt. Governor, becoming the running mate of Tom Wolf in taking on the incumbents Gov. Corbett and Lt. Gov. Jim Cawley. 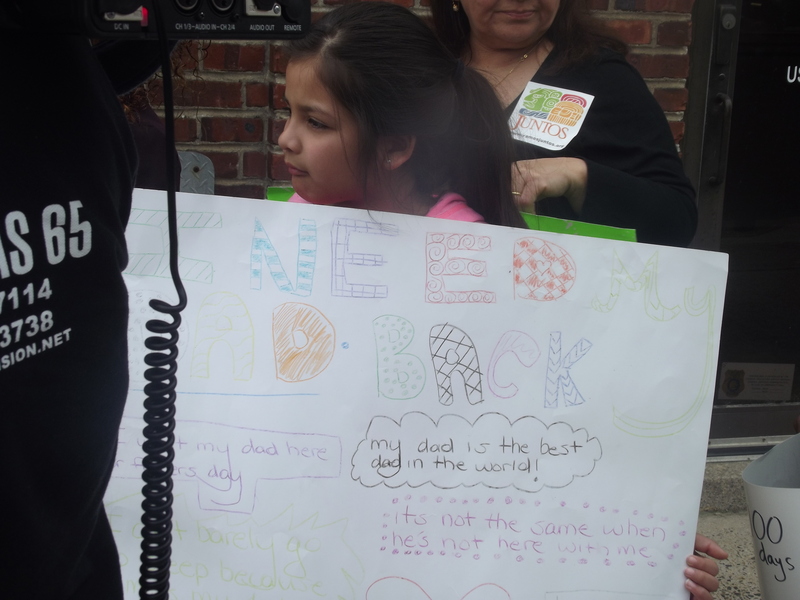 Philadelphia – In the midst the legal, economic and political polemics surrounding the issue of immigration, the voices of 9-year old Caitlin and 3-year old Ariana Resendiz, both U.S. citizens by birth, have little standing and are scarcely heard by courts and decision makers. Israel Resendiz Hernandez is an undocumented immigrant who made the mistake of trying to return to his homeland in Queretaro, Mexico, to attend the funeral of his Father. On his first attempt to come back to his family in Norristown, the father of two daughters and owner of a corner grocery store was arrested in Arizona by border patrols and returned to Mexico. Desperate to get back to wife and children, he made another and this time successful border crossing in November, and immediately made his way to his family. Local immigration agents, aware of Resendiz’s return, apprehended him on the night of January 27th, as he and his wife were closing their Chain Street store. In an effort to gain legal status through a pleading before a federal immigration judge, Resendiz’s attorney Thomas Griffin is appealing based on a “reasonable fear,” an argument that says Mr. Resendiz will face “human rights” violations if forced to return to Mexico. “The U.S. government cannot deport any person, even if he had a prior immigration (law) violation, if they express a fear of human rights violations, persecution and torture,” said Mr. Griffin. He is like other “refugees” or those seeking asylum, said Mr. Griffin, afraid to go home because he will likely be killed. The latter argument is based on multiple border crossings, and the former on a 2005 DUI charge that was subsequently expunged when Resendiz went through a rehabilitation program. “ICE knows more than anyone that he only crossed the border to go to one place, and that is to be with his family in Norristown,” added Mr. Griffin. “Asylum claims based on gang threats are currently a pretty complex and contested area of the law,” Temple University Law Professor Jaya Ramji-Nogales told El Hispano. In 2008 alone, an estimated 340,000 babies were born in the United States to undocumented immigrants, according to the Pew Hispanic Center. Moreover, according to the Applied Research Center, a racial justice think tank, the children of these “mixed-status” families -like the Resendiz children- are living with the daily “threat” of the deportation of one or both parents. Philadelphia – Just a week ahead of the May 20th primary elections, Monday’s final Democratic Gubernatorial debate at Drexel University was early on something of a tag team of State Treasurer Rob McCord and U.S. Rep. Allyson Schwartz taking jabs at the leadership and ethics of front-runner Tom Wolf. 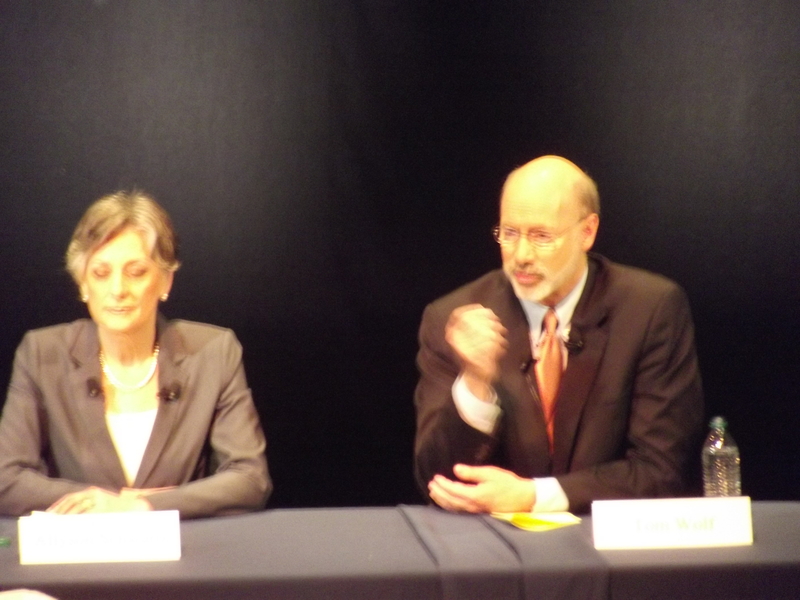 Moderated by broadcaster Larry Kane and carried by 23 television stations and nine radio stations across the state, McCord, Schwartz and McGinty went into the debate knowing they had to topple businessman Tom Wolf off his lofty perch in polls that have him ahead by up to twenty percent. McCord opened the debate by reiterating his support for a ten percent extraction tax on natural gas drilling. Double the rate of the other three candidates, McCord indicated it would, in large part, be used to fill a $4 billion funding gap in public education. Questioned by John Baer of Daily News regarding the similarity of “solutions,” and the likelihood they will face a Republican Legislature, Katie McGinty referred to the “historic legislation” passed during her Clinton years. The nation’s proclivity for “blaming the victim,” was seen as an obstacle to fighting poverty by Mr. McCord. “If we use politics right, it’s about transforming lives,” said Mr. Wolf, sounding an idealist theme reflective of his work in the Peace Corps. Questioned as to the comparison of running a business and a government drew the sharpest exchanges of the Drexel forum. Questioned as to whether they could support the nominee of the party if it happens to be Tom Wolf, Mr. Wolf drew the only laughter of the event by saying he would support himself. “But why not (nominate) the best” candidate?” asked McCord. Regarding Wolf’s support of a candidate accused of racism during 1969 demonstrations in York, Pa., Tom Wolf explained that he was in the Peace Corps in 1969. 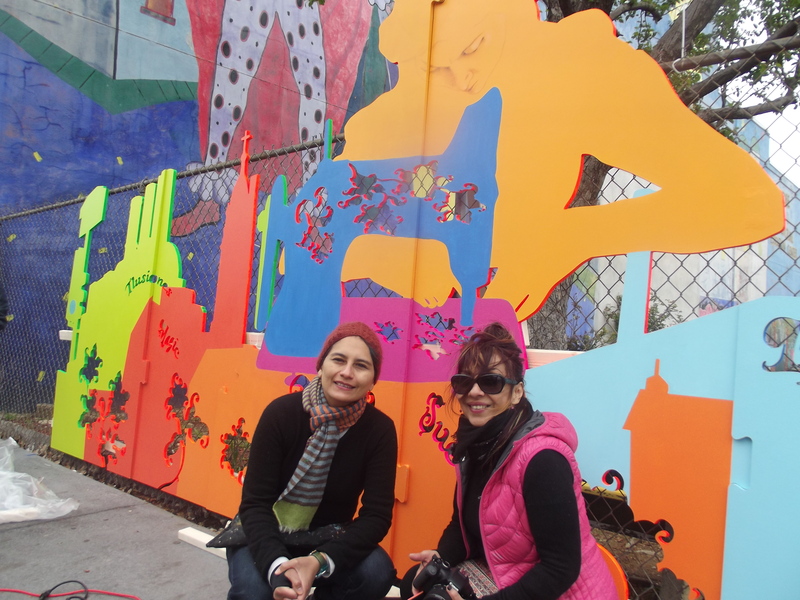 MADE IN PHILADELPHIA: Latina Artists Look at Barrio History. Philadelphia – “It’s an extraordinary artwork that pays homage to the ordinary people who made the textile industry that once dominated this area,” said Rafael Damast, the Visual Arts Program Manager of the Taller Puertorriqueno. The wooden sculpture of multiple images and components evokes a rich sense of craftsmanship, community, family and the history of a neighborhood. The work of New York-based artists Patricia Cazorla and Nancy Saleme, from the design and carving to the painting, took nearly three months. By immersing themselves in the Kensington, Fishtown and Easternorth Philadelphia neighborhoods, the artists gathered the kind of visual and historical experience they ultimately depicted on to their wooden canvas. Centered by the figure of a young seamstress, Cazorla and Saleme have juxtaposed the images of row houses, dilapidated textile factories and aging church steeples in a manner that has a sprightly narrative quality that is both compelling and complementary to the colorful Latin culture of the area. Unlike a mural, the three dimensional aspect of the sculpture better reflects the historical continuity of an area that witnessed the arrival of Puerto Rican immigrant workers in the 1950s and 60s. Both Venezuelan artists used their expertise in textiles and painting to produce a geometrical and dynamic piece of sculptural that illuminates the history of an apparel and textile industry which once provided hundreds of thousands of jobs, and some believe could be on its way back to this city. Today, due to cheaper labor abroad, the former textile neighborhoods of Manayunk, Fishtown and Kensington, provide jobs for a little more than 2,100 workers. The Puerto Rican woman looming over a blue sewing machine – a piece of purple cloth in her hands – dominates the work. Cazorla and Saleme’s soft color palette of greenish factory, brown church spire and purple row homes exudes not both a lyrical and earthy quality. While Ms. Cazorla focused on the physical arrangement of the work, Ms. Saleme, a former designer of textiles, produced the ornate floral cutouts and the wording – Ilusiones, Magic, Suenos and Life – that accentuate the piece. Mexican & Puerto Rican Athletes – Penn Relays. Philadelphia – In April of 2012 the University of Penn Museum opened an exhibition that focused on the legendary long-distance “Tarahumara” or Raramuri runners of the Sierra Madre in Northwestern Mexico. Two years later Penn’s Athletic department opened its doors to four of Mexico’s best long distance runners, along with several Puerto Rican athletes to participate in the University’s legendary Penn Relays. 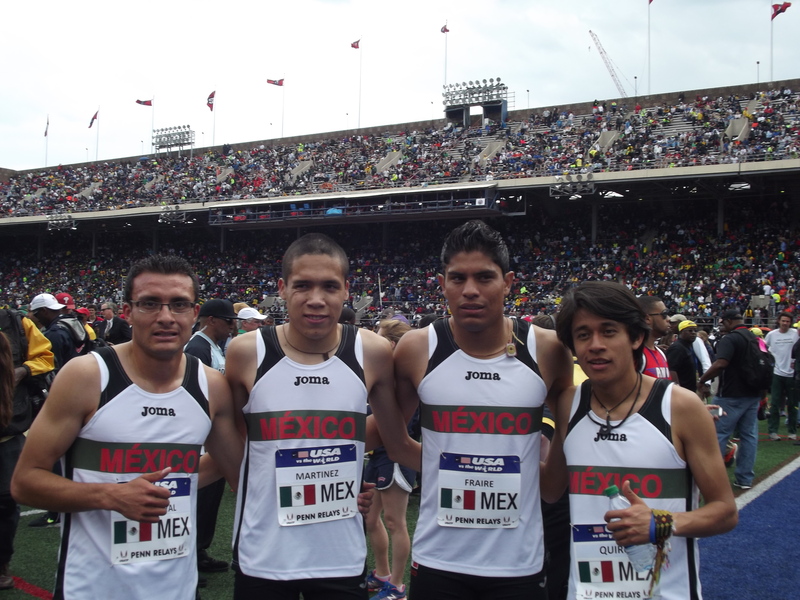 Running in the Distance Medley race in this 119th annual Penn Relays, the young Mexican team of Jose de Jesus Fraire, Bryan Antonio Martinez, Edgar Alan Garcia and Christopher Antonio Sandoval and coached by Martin Paulin. was facing a formidable array of some of the world’s elite runners. The United States team, for instance, reportedly included one Olympic Silver medalist; a widely respected Australian team also brought several Olympic hopefuls; and the team from Ireland boasted having as its anchor, John Coughlan, the son of Ireland’s three-time Olympian Eamonn Coughlan. After a relatively pedestrian start, the United States and Australia picked-up the tempo, creating a little separation from the Irish team and Mexico’s Edgar Alan Garcia. The distance medley consists of four consecutive runs: one of 400 meters, another of 800 meters, 1200 meters and a final of 1600 meters. As the U.S.turned the corner at the first quarter mark of the race, Penn’s Chief Announcer Ron Lopresti reported the time of the lead United States runner of 2.59.3, with Australia on his heels at 2.59.5. With Jose Fraire running the second leg of the medley for Mexico, Announcer Lopresti again read the order of runners, as the United States and Australia were pulling away from Ireland and Mexico. For a brief moment Australia took the lead, but the United States would quickly regain it and would not relinquish the front position for the remainder of race. Lopresti dramatically repeated, “It’s the U.S., Australia,” then pausing, “Ireland and Mexico.” And that was the order of race’s finish. The United States team of Torrence, Summers, Johnson and Menzano won with a time of 9:28.27, a little more than 12 seconds off the world record held by Kenya. In the final 1,600 meters both Mexico’s Christopher Sandoval and Ireland’s John Coughlan were already well behind, and the daunting prospect of catching the U.S. may have been disheartening for both, as Mexico’s team finished with a time of 10:00.41. Despite the disappointing finish, coach Martin Paulin said he was pleased with his team young runners, as the team posed for photos after the race. The carnival-like atmosphere of the weekend event was arguably as appealing as the relays and individual events that brought a significant number of Latino high school and college students from across the country and abroad to Penn’s Franklin Field. In preparing for his 4X400 relay, Saturday, Avi Montanez of Woodbridge H.S. in Virginia, told El Hispano that he had run up the “Rocky steps” at the Art Museum with his teammates. Inspirational as a Rocky-like warmup is, Avi Montanez and his Woodbridge team finished sixth out of thirteen teams in their race. And Reading High School’s team of Felix Hernandez, Mamadu Bari, Dante Owens and Jaie Johnson similarly faced tough competition, finishing in seventh place in their Saturday 4×400 relay.